My original aim in constructing the photo-site was to share with you a selection of the many photo's that I took during restoration work on the Montgomery Canal - Frankton to Queens Head sections. As a result of popular demand , I extended the site to cover the whole of the canal from Frankton to Newtown including un-restored and partially restored sections. As changes occur, and information comes to hand, I will add to and update each section. 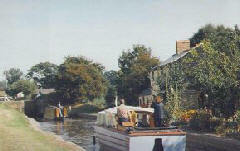 Lies between Frankton Locks and Redwith ( open and navigable as far as Gronwen Wharf ). Lies between Arddleen and Berriew. Cover the remainder of the canal between its junction with the mainline at Frankton Locks and its original destination of Newtown in Mid Wales (these also include nature reserves both on and off line). Photo-site pages are numbered below as sections. Please Click on the section number to go to the required page. Or, if you wish to go to an interactive map covering the main line of the canal from Frankton to Newtown you can click here or use the link at the top of this page. Section (3a) Aston Off-line Nature Reserve. Section (4) Maesbury Marsh to Redwith. + Mill Arm. If you would you like to comment or share your experience with others ? Please visit my Guest book page.